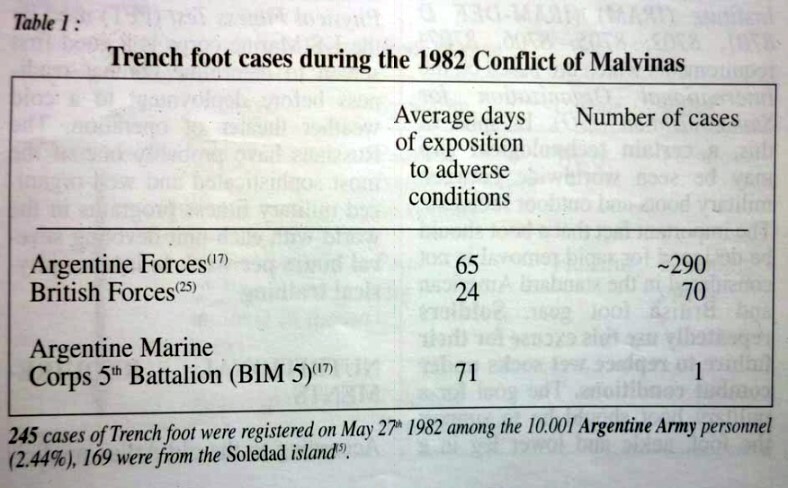 During the Conflict of Malvinas about 290 trench foot cases were observed among the Argentine forces which were exposed an average of 65 days to adverse conditions (17). British forces presented 70 cases after 24 average days exposure(25). 173 trench foot cases were assisted at the Puerto Argentino Military Hospital. This corresponds to 8,69 per cent out of 1990 patients assisted at the same hospital in the same period. All trench foot cases were from the Soledad island; 164 from the Army and the remaining six from the Navy and Air Force. The Argentine Marine Corps Nº5 were exposed to an average of 71 days but presented only one case of severe trench foot. Thirty four patients without previous rewarming were treated at the Puerto Belgrano Naval Hospital with hyperbaric chamber. Amputation was not required in 67, 69 per cent of the cases (8). Cold injury has been reported since the days of Alexander of Macedonia. On March 1780, Dr James Thatcher, a medical diarist during the United States Revolutionary War, reported " Our soldies are in a wretched condition for the want of clothes, blankets and shoes; and these calamitous circumstances are accompanied by a want of provisions " (36). 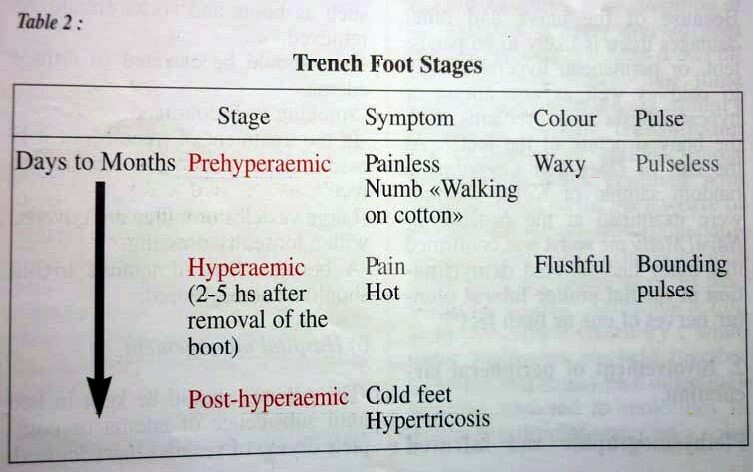 During World War I, the French Army reported trench foot as accounting 3.02 per cent of their battles casualties. During the Italian campaign of 1943 the incidence in the French forces increased to around 10 per cent (19). Cold injuries were of considerably military significance in World War II especially in the Battle of the Bulge or Battle of the Ardennes Forest (Dec 16, 1944-Jan 16, 1945). After the German counter-offensive, the US Army casualties increased at an alarming rate, several weeks reaching 50 per cent of battle casualties. US troops suffered 92,000 cases of such injuries. More than 9000 cases of cold injuries were observed in 1951 during the Korean War (2). Fourteen percent of casualties during the Conflict of Malvinas were due to the non-freezing cold injury (NFCI) so called trench foot (20). Cold injury is trauma produced by exposure to cold and includes such entities as chilblain, trench foot, immersion foot and frostbite. The type of injury produced is dependent upon the degree of cold to which the body is exposed, the duration of the exposure, and environmental factors that intensify the effect of the low temperatures. Cold injury occurs sporadicaly in the civilian population, but is of primary concern in the military service (2). Wind chill is considered to be one of the important factors in the production of cold injuries. For example a temperature of 3ºC with a wind velocity of 10 miles an hour, has the same efect on exposed flesh as temperature of -17ºC at a wind velocity of 1 mile an hour (24). 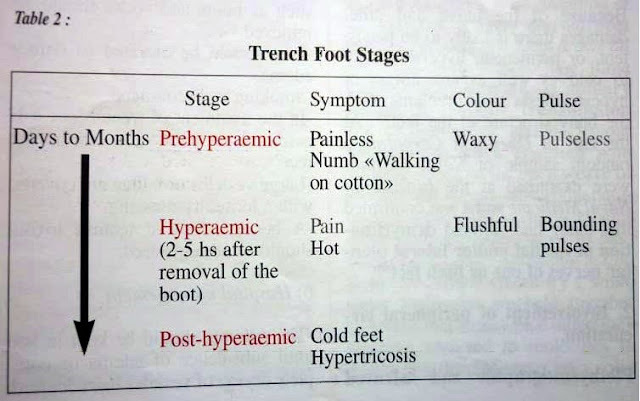 Non-freezing cold injury ( NFCI ) so called trench foot results from prolonged exposure to cold at temperatures from just above freezing to 10ºC, wetness and immobilization of the feet. For example, prolonged walking in boggy ground or sweating in impervious boots.As in frostbite damage is more likely if there is fatigue, dehydration, immobility, and tight footwear. It is most commonly seen during wartime but recent cases have been reported in elderly patients with mental impairment ( Ramstead et al, 1980). Frostbite is the term used to describe the cold injury resulting from exposure to below-freezing temperatures either " ground type " occurring in the ground forces, or " high altitude type " occurring in combat air crews (23). Immersion foot, an alternative name for trench foot, designates the cold injury resulting from prolonged exposure of the feet to cold water. It's been observed in waterlogged lifeboats (29). Of these factors wet cold is undoubtedly the most important. 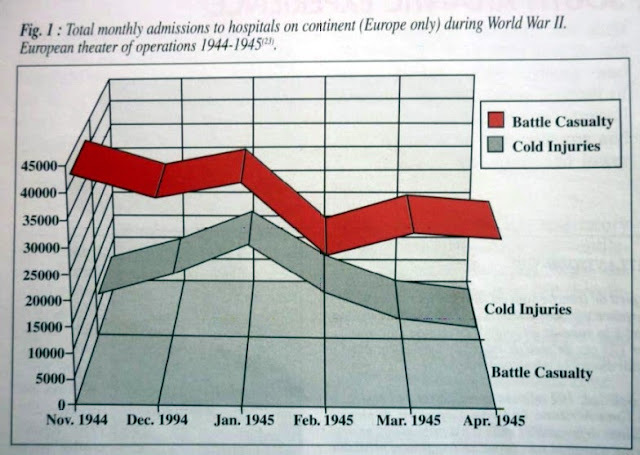 Peak casualties in World War II always followed periods of wet cold weather (23). Low temperatures and low relative humidity favor frostbite, whereas higher temperatures together with moisture are usually associated with trench foot. On the night of April 30th, 1982 the British forces initiated the attack on Argentine positions with heavy aerial and artillery fire. As a result of this, Argentine soldiers (18-22 years old) suffered a prolonged exposure immobilized in their foxholes (5). On the final stages the Argentine Marine Corps received 1000 proyectiles per hour from 54 artillery firearms from the west, 3-5 ships from the North and South besides aviation and helicopter attacks (35). 3) Physical activity following the exposure. After the exposure the soldiers try to walk but their feet are cold and numb, giving the sensation " of walking on cotton wool ". The combination with joint stiffness causes the victim to walk with legs apart to maintain balance. It was always followed by an increase in trench foot casualties. 50 per cent of the soldiers were injured in their first combat experience. During the November 1944 offensive, proper foot gear resulted unavailable in 80 per cent of the casualties. The shoes felt too small but probably was by edema. Conditions that mechanically obstruct blood flow to the extremities decrease the internal heat supply (2) . That made them foot conscious as they suffered only 20 per cent of third-degree injuries as compared to 63 per cent with similar injuries for the entire group. The Malvinas islands have a surface of 11,718 m2 and are 480 km east of Río Gallegos (Argentina). 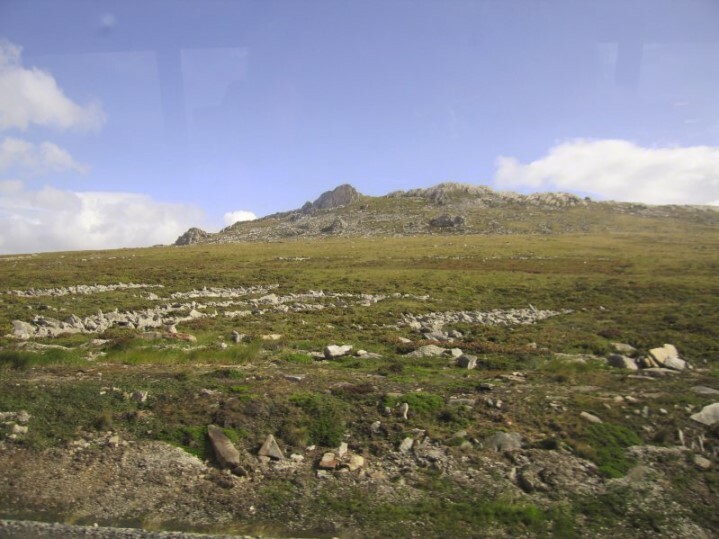 The terrain is gently rolling and rocky with several ranges of low mountains (500-1000 m). Much of the low-lying land is boggy, making overland travel, even by 4-wheeldrive vehicles, very arduous. 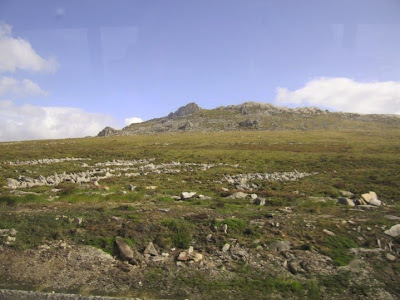 A curious feature of certain upland areas are the famous stone runs, fields of large angular blocks or quartize. The vegetation is low, dense and shrubby in a barren landscape; white grass ( Cortaderiapilosa ) and diddle-tree ( Empetrum rubrum ) dominate the plant associations. Banks of peats are built up under a light-green carpet of Astelia prunila ( a kind of lily ). Around the coastline and on some small islands an almost pure strain of tussock grass ( Poa flabellata ) is found. Once grazed by the sheep, tussock doesn't grow back. In the Malvinas the prevailing westerly winds significantly influence temperature, humidity and cloud amount. Winds average velocity are 26 km/h, gales appear on an average of four times a month and gusts have been recorded above 120 km/h. Rainfalls average 635 mm annually falling from 16 to 21 days a month with maximums in December and January. There are light snowfalls 50 days during the year except January and February. The mean average temperature is 5ºC with a minimum average of -4ºC. Average daily sunshine is about 4 hours. There are some sunny days in December and January (1). Most of the military operations in Malvinas took place during the months of April to July when strong winds were almost permanent (22). On April 27th, 1982 the Argentine naval physicians began to notice the very first cases of trench foot among the Army personnel assigned to Darwin who were assisted at Puerto Argentino Military Hospital. It was a suprise for them as although they've read about this pathology they didn't take it in count until then. The immediate action was to deliver an average of 11 socks per men (17). The reposition coefficient of underwear were almost of 150% and between 50 and 75 per cent for the rest of the equipment. This Battalion received three meals daily; a hot mess. Tortas fritas ( fry cakes ) and mate were prepared. An overlap floor made of stones placed like flagstones allowed the cold water to run freely below. The legs were placed into 200 litres empty barrels of JP. Shelters were heated with peat and since May clothes were dried through nightly rotation schedules (30). The BIM N5 composed by 707 men were 71 days under heavy fire and had only one case of trench foot. This last from the Nacar company was evacuated to Río Grande were an amputation of the right big toe was performed (17). (Table 1). British Maj Gen Nick Vaux had praise, but regrets for the performance of this Argentine Marine Corps Battalion who fought bravely and well at Mount Tumbledown on the outskirts of Port Stanley (38). Besides the medical aspects,I have mentioned the outstanding action played by the BIM 5 because, as Lynn Ashby stated in a well known article on Corregidor, " we tend to forget that adversity, sometimes even more than success helps to create pride " (3) . During World War II, the British Forces operating in Holland and Belgium up to December 31, 1945 presented only 44 cases of trench foot. The American troops by the other hand had much more cases. One of the possible reasons for such difference was that the British shoe was constructed and fitted in a way that the front flaps could aproximate each other before lacing and therefore couldn't become constricting. There was besides a strict rotation policy which relieved the troops before a major injury could occur (23). In spite of this last during the Conflict of Malvinas, the boots used by the British forces came under heavy criticism (25). Regimental Sergeant David Chisnell of the Royal Marines stated that " the boots that proved adequate above the Arctic circle gave us trenchfoot in the South Atlantic " (38). Argentine military boots are made according to the Argentine Standardization Institute (IRAM) ( IRAM-DEF D 8701, 8702, 8705, 8706, 8707 ) requirements which are based on the International Organization for Standardization (ISO). In spite of this, a certain technological gap may be seen worldwide between military boots and outdoor footwear. The important fact that a boot should be designed for rapid removal is not considered in the standard American and British foot gear. Soldiers repeatedly use this excuse for their failure to replace wet socks under Combat conditions. The goal for a military boot should be to support the foot, ankle and lower leg in a desired position and redistribute weight-bearing patterns for comfort, protection, and running. The production of a military boot designed with current technology might markedly increase the cost of the boot, the probable reduction of a 25-45 percent casualty rate in field operations would easily balance that cost (33). The Royal Marine Commandos, headed in 1982 by Lieutenant Colonel Nick Vaux, were just returning from cold weather training in Norway when they were told to " quick march " to the South Atlantic. This men were trained and equipped to operate in cold weather. This was probably not the case with most Argentine conscripts many of which came from northern provinces with a benign climate. Surgeon Commander RN Marsh stated that " Conditions ashore were ideal for the production of non-freezing cold injury " (25). According to Richards in Malvinas " It was hard to keep warm and impossible to stay dry ". " With heavy back packs the troop took up to four hours to travel one mile "; " the conditions could hardly have been worse "(34). It has been stated that the three-item Physical Fitness Test (PFT) used by the US Marine corps is a good first screen to determine combat readiness before deployment to a cold weather theater of operation. The russians have probably one of the most sophisticated and well-organized military fitness programs in the world with each unit devoting several hours per week to intense physical training (13,37). According to the old Aryan medicine...When the climate is cold and dry, the morning meal should never be neglected, and pungent, acrid and salt things should be particularly used. The body should be smeasred with oil; before bath, physical exercise is particularly recommended in this season. Wheat, jaggery, rice, Masha, meat, new grain, sesamum and massage are highly agreeable. Saffron and mush may be applied to the body. The clohing should be warm. (36). Soldiers with severe protein-energy malnutrition ( PEM ) present a delayed neovascularization, fibroblast proliferation, collagen synthesis and wound remodelling. Local factors as edema associated with hypoalbuminemia and macronutrient deficiencies contribute as well to poor wound healing. Notwithstanding, even during complete starvation, endogenous synthesis can be effectively utilized for collagen synthesis during the early phases of wound healing. In mild PEM, wound healing is relatively well-preserved despite negative nitrogen balance (4,7,21). Nerves and striated muscle are highly sensitive; skin, facia and connective tissue are quite resistant but not so resistant as compact bone or tendon. Blood vessels are highly susceptible to injury which results in leakage of plasma into the surrounding tissue. This difference in resistance has resulted in the observation in humans and animals of muscle gangrene without necrosis of the overlying skin after exposure to cold (2). Studies in vivo with rabbit hind limb models showed that large myelinated fibres were preferentially damaged. Nerve damage was found to start proximally. The initial site of injury was found at a warm-cold interface. The breakdown products of arachidonic acid have been implicated as mediators of progressive dermal ischemia in both cold and thermal injuries. Increased tissue survival can be demonstrated experimentally with the preservation of the dermal microcirculation by using antiprostaglandin agents and thromboxane A2 inhibitors such as Aloe vera (10,26).
" Most assaults involve periods of high activity interspersed with relative inactivity. 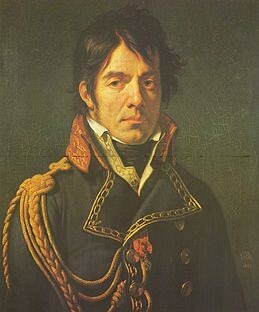 The clothing worn by the individual must obviously be compatible with the ease of movement required for fighting, but as the adrenalin is always flowing free on these occcasions, peripheral vasoconstriction will be pronounced and consequently the peripheral tissue temperatures are likely to fall considerably. After the capture of Two Sisters they were obligued to defend it against counterattack; again a period of relative physical inactivity with high catecolamine flow. A few nights on, Two Sisters was followed by the assault on Sapper Hill again the weather changed drammatically and they found themselves once more without sleeping-bags on a bitterly cold night; they were obligued to keep walking around in a figure of eight all night in order to keep warm "." In summary them, all experienced cold wet feet for most of the 24 days of the campaign. Numbness began to develop after about 7-10 days. At night, in their sleeping bags, the numbness would be replaced by some like electric shocks running up the legs from their toes. In some cases the pain was severe enough to keep them awake. On weight-bearing in the morning the pain was sometimes almost unbearable for the innitial 5 or 10 minutes, but would then gradually wane and once again be replaced by numbness on re-exposure to cold. Some particularly those with severe nocturnal pain found their feet had swollen to such a degree in the morning that they had difficulty in putting on their boots; or if it had been necessary for them to sleep with their boots on, they had difficulty in tying their laces. The 70 most severe cases were transferred to the hospital ship Uganda". " The area of pain, numbness and paraesthesia spread proximally, slowly, and it wasn't until they embarked on the ships to come home that many really had time to notice they had a problem. Sensation gradualy recovered during the voyage home and most had had a full return of sensation by the time the Canberra docked, or by the end of their leave in early September (25). We must bear in count as well that there is evidence that the thermal stress encountered in many work environments may negatively affect various aspects of human perfomance and behavior (15). During winter 1943-1944, 351 cases of trench foot were treated by physicians from the US Army. After 60 days hospitalization 17 per cent were not able to return to combat (14). 32 Argentine soldiers who suffered trench foot were studied 5 years after the injury. Rewarming curves comparison using infrared thermography indicated that all injured subjects had bad rewarming but it was not possible to determine if poor rewarming was a previous condition to trenchfoot injury or a result of injury (6). Typical foot deformities may be seen. Disappearance of longitudinal and transversal arches. The great toe contracts into a semidorsiflexion. In Third degree injuries, the shedding of the shrunken gangrenous shell of epidermis like a cocoon leaves a pink sensitive skin like a Baby Foot. Remove the person from hostile environment. All constricting items of clothing such as boots and socks should be removed. Feet should be elevated to reduce edema. A booster dose of tetanus toxoid should be administered. The patients should be kept in bed until subsidence of edema or complete drying of vesicles has occurred. All lesions are exposed to air, and a ward temperature of 21 to 23ºC should be maintained. Lesions are cleansed daily with a mild antiseptic solution. Superficial debridement of broken vesicles or necrotic tissue must be accomplished. Suppurative eschars and partially detached toenails are removed. Patients with Third degree are given antibiotic therapy until their lesions have dried. Almost all of the deleterious effect of serotonin ( 5-HT ) in the vascular system are mediated by the 5-HT2 receptor subtype.Naftidrofuryl improves glucose aerobic metabolism by an action of succinodehydrogenase and improves the blood supply and the ischemic damage of the vessel wall by blocking specifically 5-HT2 receptors without influencing the general circulatory bed. Therefore, naftidrofuryl appears to be an anticonstrictor and not a vasodilator. As a consecuence, naftidrofuryl has a targeted impact without vasodilator-linked side effects such as hypotension or the steal phenomenon (39). Extensive use of vasodilators in the treatment of frostbite in Korea did not prove to be of significant value (2). 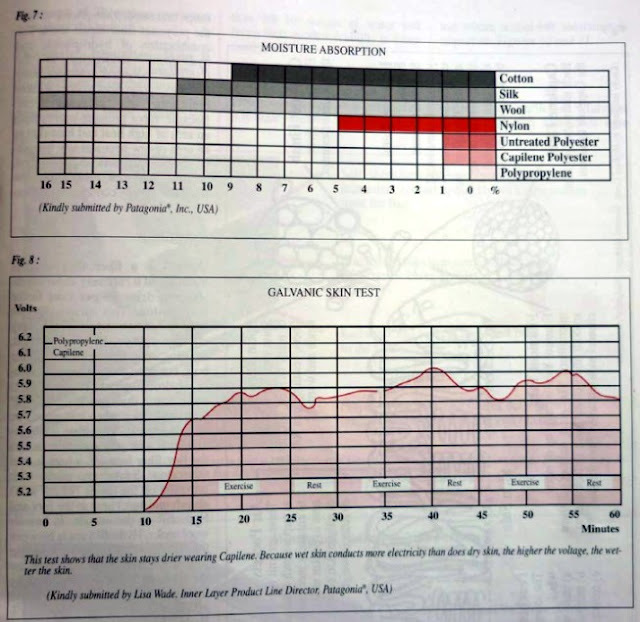 Notwithstanding, according to a personal communication, the Argentine patients in the early stages of trench foot, received 600 mg/d of the vasodilator naftidrofuryl oxalate ( Iridus Forte? -Hoescht Marion Roussel Laboratories ), complex B and in some especific caes ampicillin and dicloxacillin. No studies have been published so far. Don't drink alcohol or smoke. Avoid if possible medication containing ergotamine which produce vasoconstriction. Socks: Dry socks should be used. Always carry some extra socks and insoles. In case socks get wet they should be changed as soon as possible. Remember the old saying " keep warm, keep dry and keep moving ! " Boots: Boots should be water-proof and in case they get wet they should be allowed to dry overnight. Don't wear tight boots. The boot must be insulated in the toe, vamp, heel, and over the ankle. Position: Avoid if possible uncomfortable positions during long times. Keep your toes in movement. Layering simply means wearing a series of relatively thin layers, rather than one or two thick ones. Layers of clothing are more effective at retaining heat than thicker, single pieces. A good system employs three basic types of layers. A light, innermost layer good at keeping the skin dry. It is essential that this layer be good at " wicking " or transporting moisture through the fabric away from the skin. Nothing brings on a chill faster than standing around in damp, clammy clothing. Over this we should add insulating layers for warmth. Finish off with an outside shell layer for protection from the elements. Layers other than the innermost should be loose fitting and comfortable. The caractheristics of high performance clothes are based on: a) Wicking ability, b) Drying time, c) Thermal efficiency, d) Fit and comfort and e) Long term wear. The word wicking is an invention of the outdoors industry derived from the way the wick of a lamp draws oil from the lamp's well. 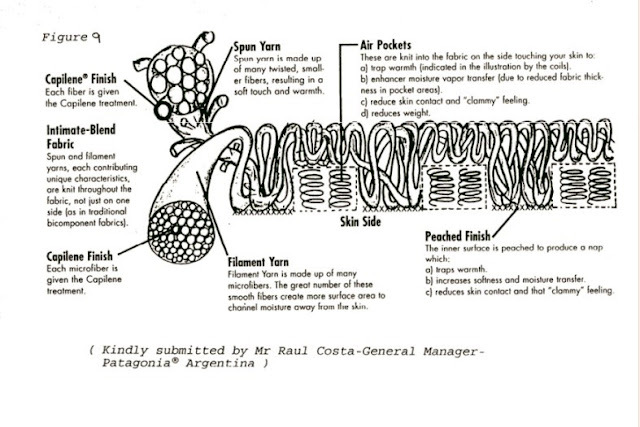 The three methods of wicking are a) Capillary action, b) Vapour transmission and c) Spreading action. Vapour transmission often confused with wicking, relies on the open weave of a fabric and the non-absorbing natue of its fibers. Natural fibers like wool, silk and cotton absorb humidity but retain it. During any activity they get wet, sticky and body heat is not enough to dry them.. Synthetic fibers offer a better chance of insulation because they wick and dry faster. Polyester ( hollow-core ) is a hydrophobic or water-repellant fiber. This is why polyesters often retain odors and stains, they repel even laundry water. Moisture tends to bead on the surface of untreated polyester because water molecules are more attracted to each other than they are to the fiber molecules. Absorbs enough water, about 5% of its weight. Its chemically bonded to the polyester and will not wear or wash out. Capilene® polyester wicks by yet a third method, known as spreading action. 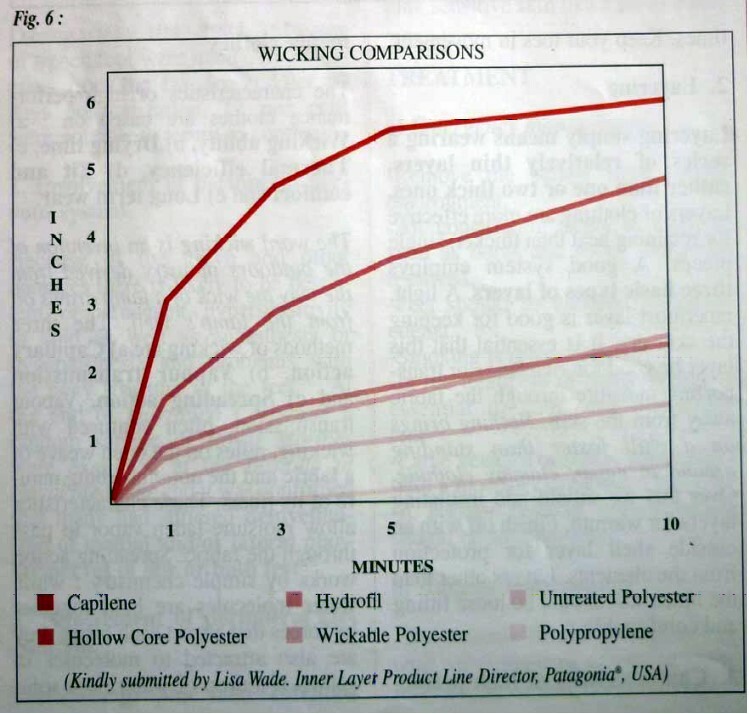 Water spreads out on Capilene® polyester in micro-seconds, while remaining in beads on polypropylene. An anti-microbial finish inhibits odor-causing bacteria and extends the number of days the underwear can be worn without washing on long expeditions. Capilene is easy to clean, can be tossed into the washer and dryer and requires no special care. Capilene stays soft and supple. In Capilene® polyester, the surfaces of the fibers are chemically altered to make them hydrophilic. A skin of hydrophilic molecules on each Capilene® fiber breaks up the surface tension of water beads, and attracts water molecules while the inner, untreated, hydrophobic core of the polyester fiber repels them. The combination of hydrophobic and hydrophilic tendencies in the Capilene® polyester transfers water molecules from fiber to fiber without drenching the polyester core. Because vapor pressure moves from an area of high heat and humidity to an area of low heat and low humidity, body heat acts as a catalyst, pushing moisture away from the body toward any cooler, drier atmosphere. Hidrofil is a fiber that absorbs moisture at a rate very close to cotton, but dries 50 per cent faster than cotton. This means that the Hydrofil® fibers work like a very effective sponge, on the one hand, actually drawing ,moisture off the boot, but once it receives the moisture, Hydrofil spreads it out over its surface so it dries quickly. Hydrofil® yarn works best when it is placed on the outside of a twofiber construction so it will pull moisture though the first fiber to itself, where it then " desorbs ". Socks are made with polyester on the inside (which won't absorb moisture) next to the foot and Hydrofil® on the outside. In heavier wool socks, Hydrofil yarn in between the wool so that moisture from the foot is absorbed ( and desorbed ) by the Hydrofil before it's absorbed by the wool. The wool/Hydrofil® socks " BTU's " ( 75% preshrunk wool, 25% Hydrofil® ) weigh 267 grams per pair. Thinsulate® Type B absorb less than 1% of their weight in water and provide nearly twice the warmth of foam, felt, or pile. Three weights of Thinsulate insulation are available for footwear applications: 200, 400, and 600 grams. 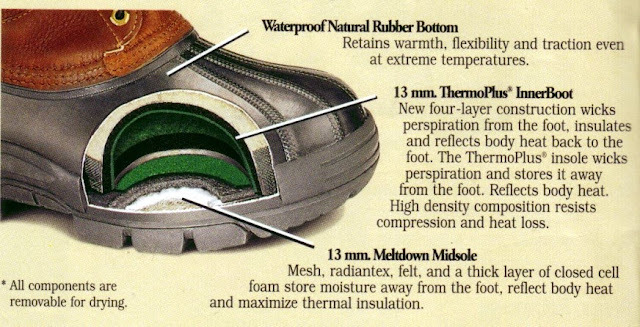 Thinsulate Ultra® insulation for footwear provides the ultimate in cold weather performance. Manufacturers must use a minimum of 400 grams of Thinsulate insulation throughtout the boot. Thinsulate® Insulation Type B developed for footwear products is designed to resist compression while maintaining warmth under moderate pressures. The fibres absorb less than 1% by weight of water and retain their insulation ability in damp conditions. Thinsulate® Ultra Insulation is a premium insulation is composed of 55% polyester and 45% polyolefin. It is highly flexible and designed for use where a mid-loft insulation is important. Ashby,Lynn-From adversity comes strength-Marine Corps Gazette- November 1988,p 4. 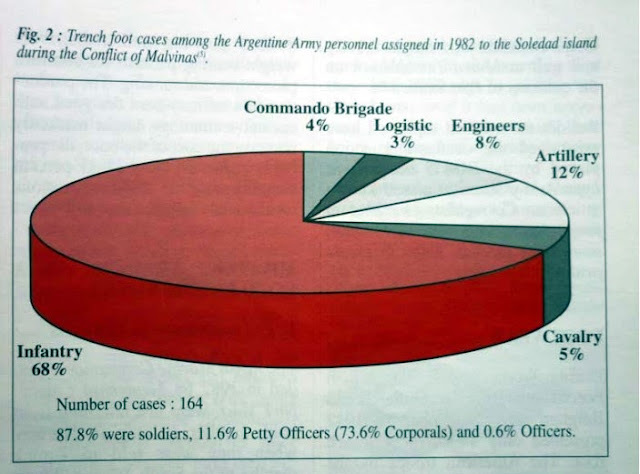 Buroni,José R, Ceballos, Enrique Mariano-Pie de trinchera- ( Trench foot: general review and experience in Malvinas)-Rev Argent Cir; 52 (1/2): 59-65, ene-feb, 1987. Campana, Juan M-( On reference to the work of CFME Federico G. Horgan and his Surgical Division of Puerto Belgrano Naval Hospital ) -Rev Argent Cir; 52 (1/2): 59-65, ene-feb, 1987. Ceballos, Enrique Mariano, Buroni,José Raul-Malvinas' conflict: Argentinian experiences in military health-Rev Sanid Mil Argent; 85(1):22-9, ene-jun 1986. Darrigrand A et al Efficacy of anti perspirants on feet-Mil Med,157(5):256-9,1992 May. 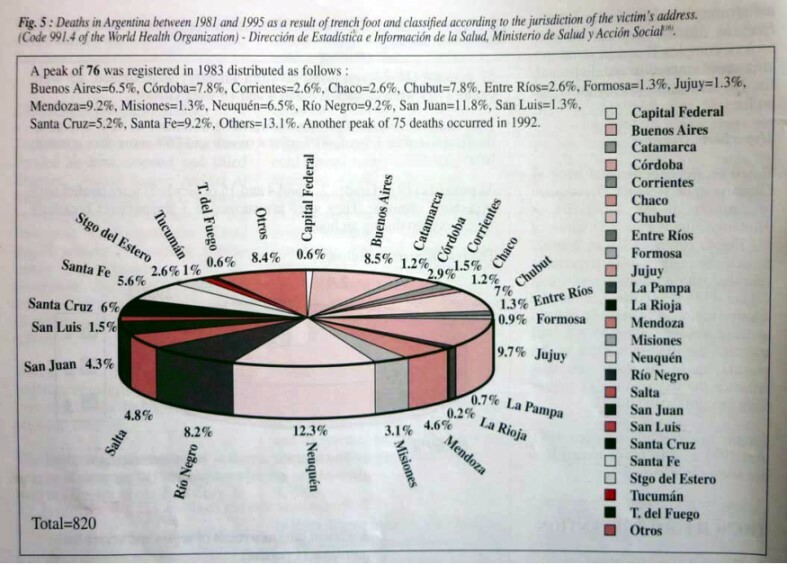 Fernández, Mercedes Licenciada-Defunciones por pie de trinchera clasificadas según jurisdicción de residencia del fallecido-República Argentina 1981-1995- Dirección de Estadística e Información de Salud del Ministerio de Salud y Acción Social. 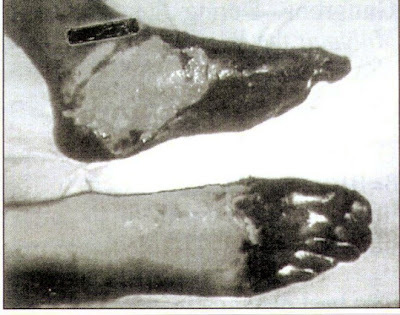 Fritz RI;Perrin DH-Cold exposure injuries:prevention and treatment-Clin Sports Med, 8 (1):111-28, 1989 Jan .
Irwin MS, Sanders R.,Green CJ,Terenghi G-Neuropathy in nonfreezing cold injury (trench foot). J R Soc Med 1997 Aug,90(8):433-438. 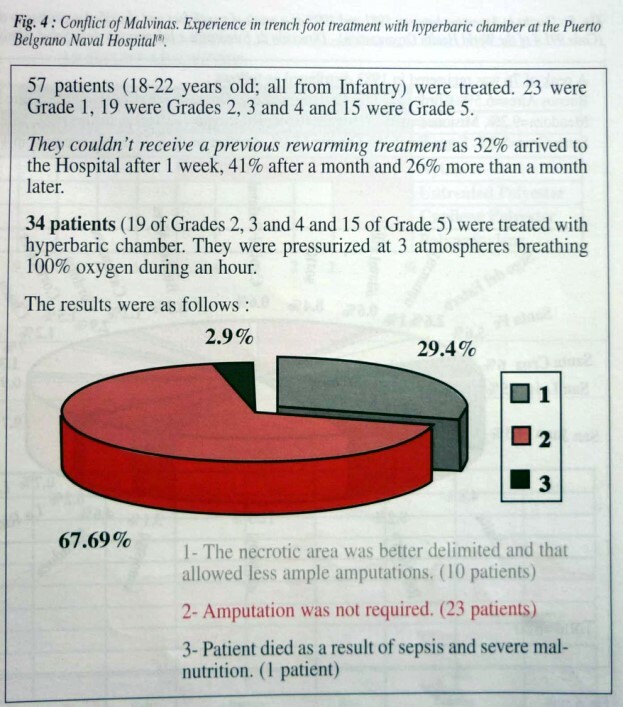 Okuboye JA, Ferguson CC-The use of hyperbaric oxygen in the treatment of experimental frostbite-Can J Surg 1968 Jan 11(1):78-84. 29-Parsons SL, Leach IH,Charnley RM-A case of bilateral trench foot Injury, 24 (10):680-1 1993 Dec.
Robacio, Carlos Hugo CFIM-El Batallón de IM N?5 en Malvinas-( The Marine Corps 5th Battalion in Malvinas )-Boletín del Centro Naval. Trainor, Bernard E. LtGen USMC (Ret)- Reflections on the Falklands-Marine Corps Gazette-Jan 1989.